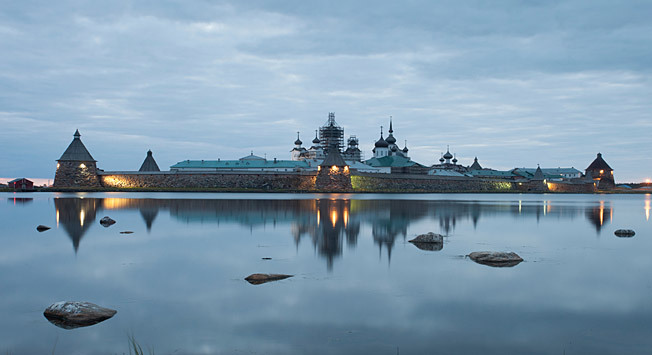 The Solovki Archipelago (aka the Solovetsky Islands) in Russia’s North is a very contradictory place, at the same time holy and desecrated, romantic and harsh, hideous and gorgeous. One thing is certain: this shred of land, frozen for most of the year, won’t leave any person indifferent to the fates of humankind. In the mid-20th century the most hideous concentration camp of the Soviet Union was located here. The extremely harsh climatic conditions and, given the distance from the mainland, the difficulties in providing the archipelago with food supplies, led to the spread of mortal diseases among the prisoners. These unfortunate people were tortured and humiliated and were forced to drag stones or logs from one place to another and to sing “The Internationale” out loud (the international proletarian hymn) for hours at a time. Here 10,000s of people were shot or died because of torture and inhumane working conditions. However, today the Solovetsky Islands is one of the quietest places in Russia. What can you do in a place endowed with such a dark aura, yet that also features such incredibly stunning landscapes? You can reach the Solovki Islands by plane from Arkhangelsk, but going there by motor ship from Kemi or Belomorsk is much more interesting. Don’t forget to bring some bread to feed the seagulls. Imagine that you’re wrapped up in plaid on the deck of a ship crossing the White Sea, while big white birds are flying behind you, squeaking and skillfully catching the food you throw at them in mid-air. This idyll is broken when all the other tourists pour out on the deck. Each of them wants to get a glimpse of the unforgettable sight of the austere silhouettes of the stony walls and towers of the Solovki fortress emerging little by little through the mist. On the main island of the archipelago, Bolshoi Solovetsky Island, where the motor ship docks, are comfortable hotels that come recommended. After an excursion to the Solovetsky Monastery, renowned for its impressive history, rent a bike and ride around the village of Rebolda and its wooden houses, with cows grazing on the grass and goats roving along its sandy streets. Officially only one person lives here. In winter he is the only one who remains in the village, while in summer, the Pomory, a northern indigenous group, leaves the mainland to come here to work. As hundreds of years ago, they go to sea on their boats with their long rakes to gather seaweeds and kelp from the seabed, which they then hang to dry on barbed wire. Taking a walk around this stony and windy island is unforgettable. Here you’ll find picturesque views at every step. But you’ll have to be patient to post anything on Instagram as there is no internet on these islands. But here you won’t be immune to this place’s dark past. You’ll stumble across wind-worn wooden poles with rusty barbed wire. People who are particularly sensitive may suddenly experience a change of mood and feel a strange and oppressive anxiety. It was precisely along this opening that the camp’s narrow gauge railroad embarked to go down a road of suffering and desperation. The interesting places of the archipelago are not limited to Bolshoi Solovetsky Island. It is worth taking a look at Bolshoi Zayatsky Island as well. In Soviet times there was an isolation block for women here. On Bolshoi Zayatsky Island there is an amazing tundra flora that bears no resemblance to anything else and there are strange, but edible berries, as well as the wooden chapel of Andrei Pervozvanny. Built by Peter I in 1702, it is a typical church of the Russian North. Indeed, its cross illuminates a pagan land. If you venture far into the island, you’ll see some embankments made of stones on the sides of the paths: they’re ancient cemeteries. But the most impressive constructions are the old labyrinthes. Scholars think that they precede our era by centuries. Experts still have different opinions on what they were used for: either as diagrams for fishing nets, for ritual images, or for the burial of an ancient shaman whose spirit would never manage to get out of the maze.